EXECUTIVE HOME on PRIVATE ACREAGE! 5 Bedrm handcrafted home by local German family, you will love the upgrades & fine craftsmanship that this home has to offer! Built in 2011 yet shows like new. Main floor master bedrm with ensuite & walk-in closet; Oversized office, full bathrm & laundry rooms on main floor too. Hardwood floors with granite tiles, Huge open concept with large bright windows, wood burning fireplace, custom cabinetry in large bright kitchen with granite counter tops, large walk-in pantry. Upstairs offers 4 Bedrms (no closet in one), a central den area & a spa-like 5 piece bathrm with soaker tub & walk-in shower. All washrms have wall hung high efficiency toilets & high end fixtures. Stunning oak doors & frames with mortised hardware throughout. Att garage w/storage room areas. Forced air furnace with heat recovery system & air conditioning. Wood burning fireplace centrally located off foyer & living room. Also a fireplace in the detached shop with washrm & sauna; Coverall bldg included. Fantastic gardens with irrigation system, Every kind of fruit tree, 8 in total that include apple, peach, apricot, cherry, plumbs & peaches!! 2.7 Acre property spans the road with a hooked piece that can host another shop. Covered area for bikes, mowers & tractors; Backs onto Carlson Creek. Dog pen area/kennel. Non-zoned area allows mixed uses. 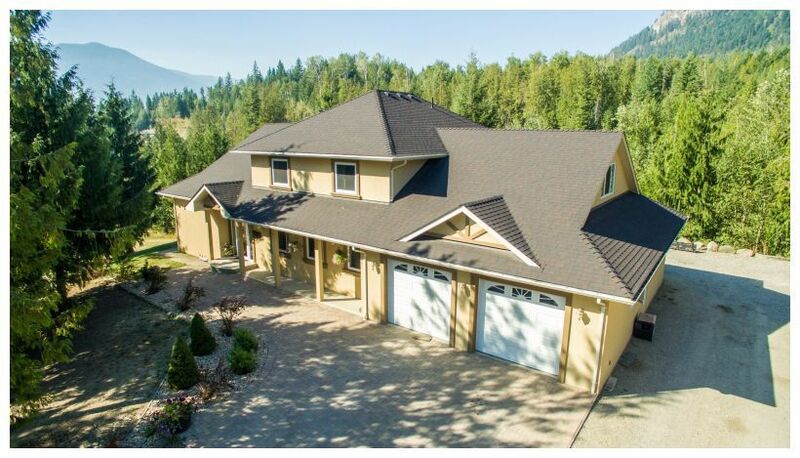 Located just off Tappen Valley Road, just 15 minutes from Salmon Arm in the Recline Ridge Estates Sub-division which is also just 15 minutes from the public boat launches & beaches at Blind Bay, Shuswap Lake. See more info here at BIGRob.ca and then call Rob McKibbon today for your personal viewing appointment! 250-804-6288 local or 1-866-463-2791 Toll Free. Thanks for your interest!